Did you hear? We are celebrating our Birthday and want to thank the Winnipeg community for the overwhelming support we have had this year, so we've invited everyone we know!! We made our goal of '100 families Going' to the event through our Facebook event page and are giving away a $20 Gift Card to Tim Hortons. Because we know how much we mama's and papa's love our coffee!! We'll be sure to have another contest once we reach 150 Going, so keep on sharing the event and invite your family and friends with wee little ones at home! So it's simple. In order to win it, we just want to know your favourite themed birthday party that you've ever planned. Could be for your kids, yourself, your husband, friend, brother, sister, parent, ect. You get the picture! So comment below and remember to leave me your email address or momstown user name so I can contact the winner. 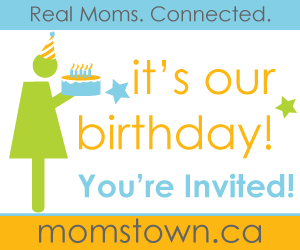 And just for fun, if you have a photo of your Birthday Party be sure to share it with all of us on our momstown Winnipeg Facebook page. Contest ends midnight this Sunday, July 29, 2012. Contest open to all guests living in the Winnipeg area who have signed up to attend our Birthday Bash this August 19. For details of our Birthday Party click here. Good luck! Congrats mommyJ. And thank you everyone who participated! I just did my first Transformers party. Noah was so excited to see the Optimus pinata. Lol. Can't wait for this years party with all my mt'ians. Thank u so much Ester, you and momstown have changed my life. Love mommyj. I have only planned my daughters 1st Birthday so far and it has been so much fun. Since I have my own business making Tutus I decided to make her birthday outfit. I chose a Cupcake costume so that she is the Cupcake!!! The bottom layer is an ivory color for the cake, and then a short pink layer is on top for the icing. We also got a pink shirt and embroidered a number 1 candle on it!! It turned out really great. We made Healthy banana cupcakes with a banana glaze icing for the other babies attending so they would not have to eat the sugar filled cake we were having!! I, too have only planned one birthday for my daughter but it was great! We did a garden party theme with butterflies, flowers and different bugs (all decorations) every where. I made 3 cakes with hand made decorations and cupcakes with flowers. All the girls wore flowered dresses and the party gifts were pots with seeds to plant when the kids got home. Amira had a great time and Mama cried during the birthday song :). The other entries sound great as well...gives me some ideas for the future! My favorite birthday party theme was my son's 2nd birthday - Choo choo trains, but we called them 2-2 trains. We rented out my son's pre-school room and a party room for food. I printed off our own invitations with a 2-2 train and tracks that led to info: date, time, menu, directions, etc. For the party we got train signs leading to the party room which we called the station, and a train crossing to the playroom. We printed out our own name tags using envelope labels with red cabooses. For crafts we had older kids draw pictures of trains and we had pictures of trains without wheels so the really young kids could use bingo dabbers to draw wheels on the trains. I also printed sheets of paper with train tracks and created our own train stickers using envelope labels. We had three cakes, shaped like a train engine, a train car and a caboose. To get the kids to calm down before opening presents, I told the story of "The Little Engine That Could" using the pictures that the kids drew, kind of like puppets. For the gift bags, we had wooden train whistles, little wooden toy trains, train stickers and chewy bars (chew chew, haha). For our sons 3rd Birthday Party we did a hockey theme/afternoon. Our whole family proudly wore our Jets Jerseys, we had hockey puck balloons, banners, etc. Then the whole party gang headed over to the outdoor rinks for a fun afternoon of skating and hockey. (we even had babies on strollers on the ice) We then ventured back home for hot chocoloate and marshmellows. The kids had a blast! Planning my son's second birthday since he loved construction trucks, we went with that theme. I made invitations where "foreman Edwin" invited his friends to the "contrustruction site", and there were pylons, caution tape and homemade bunting banners with different construction trucks on it as decorations. My baker friend made a construction themed cake with truck candles, and we had little hard hats for the kids. It was a blast. The next birthday coming up is the best I have had the enjoyment of planning. My little girl is only turning one but we watch a lot of Diago and Dora due to my 2 year old loving them. I'm doing a Dora and Diago themed party for both of hem as there birthdays are only a day apart. I can't wait to see my 2 year olds face at the cake and decorations. Planning my daughter's 2nd birthday party was a blast. It was Sesame Street themed and I must admit probably went a little over board. We decided on the theme in December and from then until June, I started working on things. I started with the decision that I would hand make the invitations and birthday banner. As time went on, even though I had never done designed cupcakes or a cake, I also decided I would try my hand at customized cupcakes and cakes so I also made elmo, cookie monster, big bird and oscar cupcakes and a big bird cake - all personalized for her. I also had themed goodie bags that had things like sesame street whistles, straws, thermos, snack bowls, sippy cups, colouring books, wrist bands, flash cards and books. All of the decorations were themed too - most were store bought but I made S/S labels for the water bottles and did napkin wraps in sesame street and also did candy trays in the faces of big bird, cookie, oscar and elmo. Lots of work but so worth it! My email is bo__1@hotmail.com and user name is Larina. I've only planned one theme party for my son so far, it was Sesame Street theme, with huge Elmo cake and Big bird, Cookie Monster, and Elmo cupcakes, Elmo Balloons and plates cutlery in primary colors to go with the Sesame Street Colors. We had a lot of fun...and I think that's where my son's obsession for Elmo began...lol.